How many Google Readers do you have? 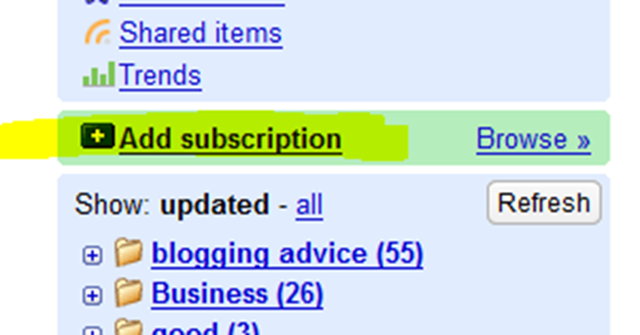 Google has recently updated Google Reader to allow you to check the number of readers for each of your RSS subscriptions. Which can be handy feature when faced with cutting back on the number RSS subscriptions you have time to read. You can also check the popularity of your own blog. This is something I do on monthly basis as a way of measuring our blog development. Now depending on the way you read it (picture above), I either have 11, 17, 22, 28 or 39 readers who subscribe to the blog using Google Reader. According to Feedburner its 28, but that won’t take into account those who are subscribed using the raw feed not produced by Feedburner. While on the subject, make sure your blog doesn’t make that mistake by seeing my post on WordPress and Feedburner. Finding the number of readers that use Google Reader? Okay lets cut to the chase, how do I check the popularity of my blog with Google Reader. At the moment this is a closed system, so head over to Google Reader if you don’t already have a free account. Type the name of the blog you wish find out the numbers for and click Add. Here we have searched for our good friend Mike from Digital Agency. I would say Mike has a nice health 76 readers who read his blog using Google Reader. Now what would happen if Google decided to use this metric to determine website rankings? In one easy swoop Google has become a social search engine. Now you can understand why Google doesn’t appear interested in buying Facebook, but would rather compete with it. Google recently purchased Jaiku (Twitter type of service) and Zingku (Facebook for mobiles) maybe Google is up to something with its social networking site, Orkut?